New Catalinbread Belle Epoch Tape Echo Delay Guitar Effects Pedal. This item is new, in box! Faithful sonic recreation of the EP-3 tape echo. The Catalinbread Belle Epoch is the closest thing to a real EP-3 that Ive ever played. 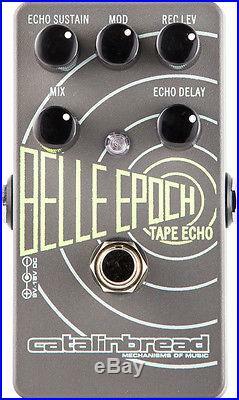 The Catalinbread Belle Epoch Tape Echo, has tape echo sounds so authentic youd swear there was tape inside the pedal! Inspired by the Maestro Echoplex, EP-3 model, perhaps the most famous tape delay ever, the Belle Epoch features everything we love about the EP-3 in a small, maintenance free pedal format. We felt that a tape echo pedal was much more than just a standard digital delay with some filtering on the repeats. There are a lot of subtle and not-so-subtle traits of the Echoplex that needed to be implemented in order to be authentic. The preamp, the self-oscillation character, the ability to control the record level of the signal hitting tape, the wow and flutter, the way the repeats decay, the way the circuit interfaces with the amp and other pedals all these things were important to get right. The original unit was used as a musical instrument unto itself and this is what we captured with the Belle Epoch. Preamp Famous for making your guitar sound better even when the echoes are turned off. Quality of repeats The Echoplex was not necessarily hi-fi. As the echoes repeated, the signal got progressively degraded, losing low end and gaining a shiny, percussive top end with a bit of grit. The first repeat is strong and then it gets more and more diffused as it repeats. And in a well-tuned unit, you could dial in the repeats Echo Sustain so that it would float almost indefinitely, or cross the threshold to self-oscillation. Record level Theres a control on the EP-3 that sets how hard the tape gets hit. While this control was ostensibly used to optimize signal-to-noise ratio, set low it would give light and airy repeats and set high it would saturate the tape hard and give an awesome fat and grungy repeat tone. Wow and flutter We designed the Belle Epochs modulation control to simulate the daily mechanical irregularities inherent in original Echoplex units. This would typically include bumpy capstan wheels, uneven tape tension, uneven motor speed, humidity, and actual ghosts? Head drag The original unit had a unique quality that when moving the delay time slider it took a moment to catch up to the adjustment, creating a doppler like effect. The Belle Epoch reproduces this behavior while you turn the echo delay knob. The item "New Catalinbread Belle Epoch Tape Echo Delay Guitar Effects Pedal" is in sale since Monday, September 21, 2015.